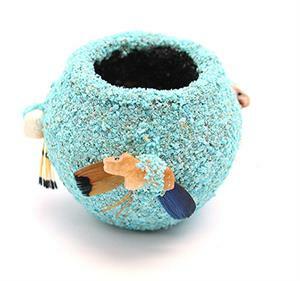 This fetish pot is covered with natural turquoise chips and has small assorted colored fetishes and feathers. It also has grinded corn pollen inside with a small fetish. Small pot measures 2" diameter and fetishes measure 3/4" long, 1/4" wide, and 3/8" in height. Native handcrafted by Zuni artisan Marvelita Phillips. Animal fetishes will vary.